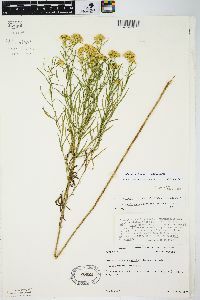 Perennials, 25-100 cm. Stems (branched distal to midstems) glabrous or glabrate, not glaucous. 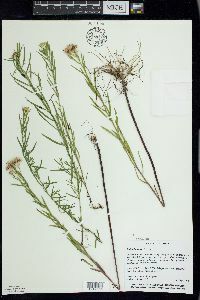 Leaves deflexed to erect; blades 1-5-nerved, linear, 24-70 × 1-3 mm (to 6 mm wide in some Maine and Nova Scotia populations), lengths 7.7-42.2 times widths, abruptly reduced distally, lax- to firm-herbaceous, apices obtuse to long-acuminate, faces abundantly and prominently gland-dotted (34-86 dots per mm 2 ), glabrous, glabrate, or scabro-hirtellous on midnerves. 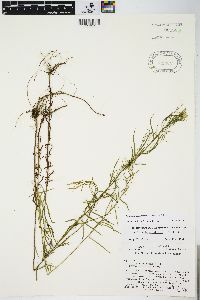 Heads pedunculate or glomerulate, usually in flat-topped or rounded arrays 10-40% of plant heights (often with multiple layers, proximal branches 0.5-1 times array heights). Involucres campanulate to turbinate, 3-4.7(-5.3) mm . Phyllaries usually green-tipped, outer ovate, inner oblong-linear, apices obtuse to acute. Ray florets 7-17(-25). Disc florets 3-22; corollas 3.3-4.8 mm. 2n = 18. Flowering Aug-Dec. Open, moist to wet, sandy soils, lake shores and dunes; 0-100 m; N.S. ; Ala., Conn., Del., Fla., Ga., Ill., Ind., La., Maine, Md., Mass., Mich., Miss., N.H., N.J., N.Y., N.C., Ohio, Pa., R.I., S.C., Va., W.Va. J. L. Reveal (1991c) determined that the types of Erigeron carolinianus and Solidago tenuifolia are conspecific. 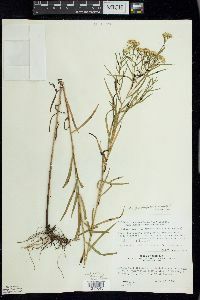 This goldenrod also prefers the moist soil of prairie habitats but is found also in dry sand and in wet woods. Restricted mostly to northwestern Indiana. 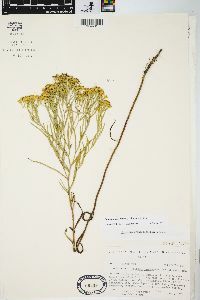 This and the preceding species [Solidago media] are closely allied and in the extremes are difficult to separate and both species may be considered only as varieties of Solidago graminifolia. 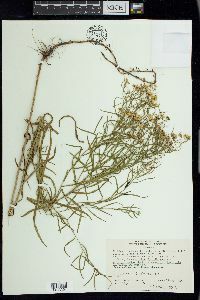 When the literature is considered it is apparent that authors are far from unanimous concerning the status of the species of the section Euthamia of the genus Solidago. 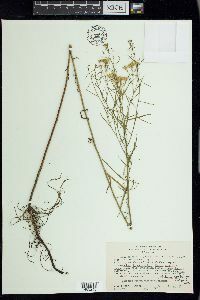 I have made no field study of the group and my conclusions have been drawn from the literature and from my specimens.